Facts about Whitetip Reef Shark, "Scientific name for Whitetip Reef Shark is Triaendodon obesus". The Whitetip Reef Shark is a type of requiem shark and a member of the family Carcharhinidae. It is the only member of its genus Triaenodon. The white tip reef shark is sometimes called the white-tip reef shark, reef whitetip and blunthead shark. whitetip reef shark, blunt-head shark, light-tip shark, reef whitetip shark, whitetip shark, and white-tip shark. The Whitetip Reef Shark received its name for the white tip on its first dorsal fin and tail on an otherwise dark blue body. The Whitetip Reef Shark have a smattering of dark gray spots along the sides of their bodies. The whitetip reef shark has rarely exceeds the length of five feet (1.52 meters), though a few Whitetip Reef Shark up to seven feet (2.13 meters) have been caught. The Whitetip Reef Shark is not the oceanic whitetip shark which often reaches ten feet (3.04 meters) in length. The Whitetip Reef Sharkwas first identified by Ruppell in 1837. They have forty to fifty teeth on each jaw, with more on the upper jaw, all aligned in two rows. Sharks have the most powerful jaws on on earth. Whitetip Reef Sharks jaws, both the upper and lower jaws move. The Whitetip Reef Shark lives in tropical reefs, usually in the fore-reef. They are territorial with preferred reef resting sites. The rarely range more than half a mile in any direction. Whitetip Reef Sharks are more social than other shark species, often resting together on the sea bottom during the day. The Whitetip Reef Shark is more active at night. White tip reef sharks eat nocturnal species like octopus, spiny lobsters and crabs as well as fish. The Whitetip Reef Shark will work together in groups sweeping over the reef to drive out fish to feed upon. The Whitetip Reef Shark bear one to five shark pups per litter after a gestation period of twelve months. The Whitetip Reef Shark take about eight years to reach sexual maturity. White tip reef sharks do not attack humans. They will however approach fish that have been speared. White tip reef sharks are sometimes hunted for their meat. 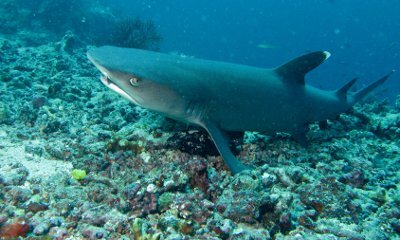 The Whitetip Reef Shark is mostly present in the shallow waters north of Australia, off southeast Asia and the Pacific islands. They also occur around the African and Indian coast. There are over 400 types of sharks, Whitetip Reef Sharks skin is made of denticles instead of scales like other fish. The denticles are constructed like hard, sharp teeth (tooth-like projection) and this helps to protect the Whitetip Reef Shark from being injury. The Whitetip Reef Shark is carnivores meaning: an animal that feeds on flesh (Meat).